REUTERS/Lunae ParrachoA Brazilian drug gang member nicknamed Poison, 18, poses with a gun atop a hill overlooking a slum in Salvador, Bahia State, April 11, 2013. Murder is more common in Latin America than any other part of the world. That’s the most striking takeaway from a ranking of the most violent cities compiled earlier this year by Mexico’s Citizens’ Council for Public Security and Criminal Justice. The ranking doesn’t count deaths in war zones or cities with unavailable data. ne-third of global homicides occur in Latin America even though the region has just 8% of the world’s population, according to United Nations data. Drug trafficking, gang wars, political instability, corruption, and poverty combine to cause the region’s elevated violence. US cities also made the list, led by Detroit at number 24 and New Orleans at number 26. 50. 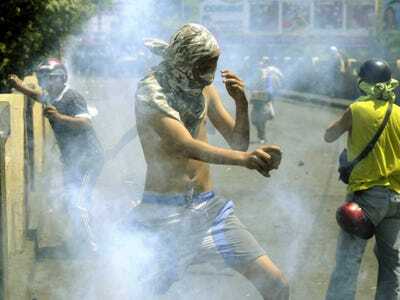 Valencia, Venezuela had 30.04 homicides per 100,000 residents. 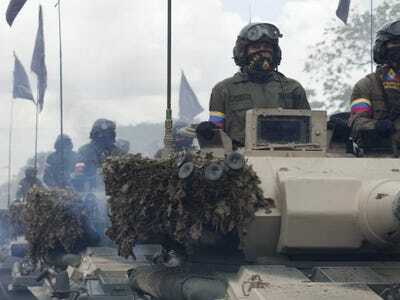 Battle tanks of the Venezuelan Army take part in a military parade to celebrate the 188th anniversary of the Battle of Carabobo in Valencia, Venezuela June 24, 2009. 48. 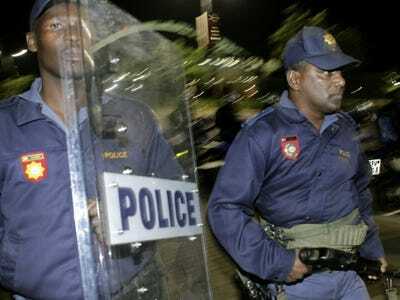 Durban, South Africa had 32.42 homicides per 100,000 residents. Police and riot squads advance on World Cup security stewards from Moses Mabhida World Cup stadium as they protest against low wages hours after the Australia Germany match during the World Cup in Durban, South Africa in 2010. 47. 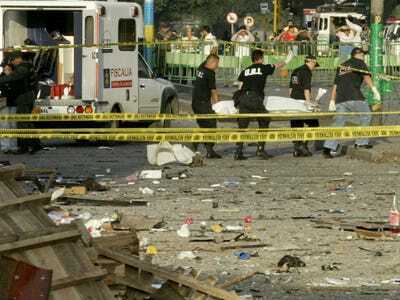 Tijuana, Mexico had 32.50 homicides per 100,000 residents. 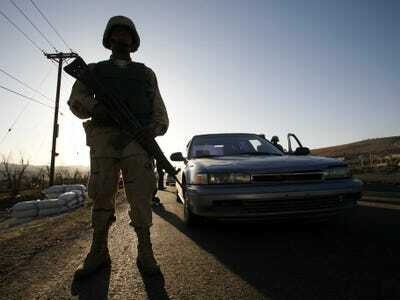 A Mexican soldier stands guard as others inspect a vehicle at a checkpoint on the outskirts of Tijuana Jan. 6, 2007. 46. Aracaju, Brazil had 33.36 homicides per 100,000 residents. Prisoners stand on the roof of the Advogado Antonio Jacinto Filho state prison, in Aracaju, Brazil, Monday April 16, 2012. 45. St. Louis, US had 34.14 homicides per 100,000 residents. 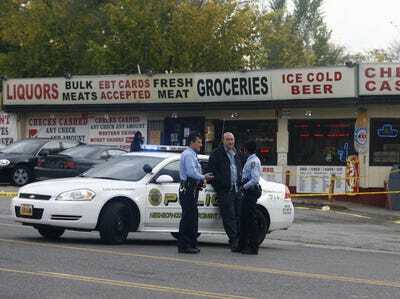 Police gather outside a store where two men who were involved in a shooting were found by police, in Wellston, Missouri Oct. 27, 2011. 44. Belo Horizonte, Brazil had 34.73 homicides per 100,000 residents. 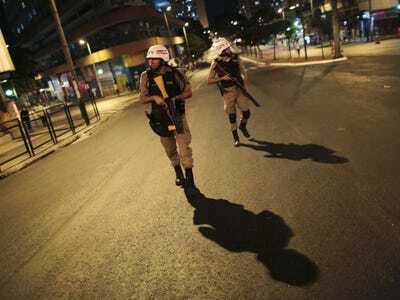 Riot police secure the area during a protest on the streets of Belo Horizonte June 26, 2013. 43. Cuernavaca, Mexico had 34.91 homicides per 100,000 residents. A van driven by former soccer Mexico defender Ignacio Flores sits riddled with bullets on a roadside in Cuernavaca, Mexico, Wednesday Aug. 10, 2011. 42. Maracaibo, Venezuela had 35.44 homicides per 100,000 residents. 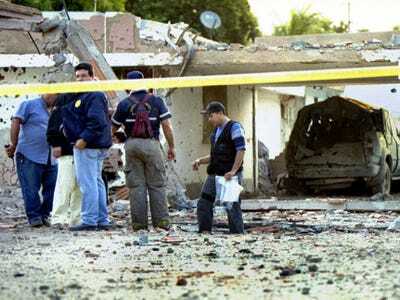 Venezuelan anti-bomb squadron officers inspect the debris of a house after a suspect car bomb exploded in Maracaibo, Venezuela, March 2, 2003. 41. Nelson Mandela Bay, South Africa had 35.76 homicides per 100,000 residents. 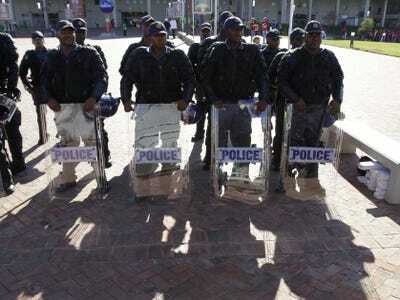 South African police officers stand guard outside of the Nelson Mandela Bay stadium in Port Elizabeth, South Africa, Saturday, June 12, 2010. 40. 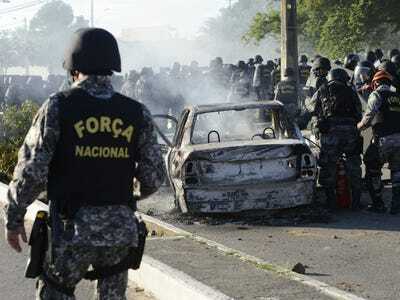 Macapá, Brazil had 36.59 homicides per 100,000 residents. 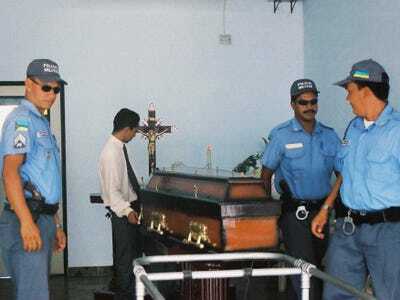 Security officers surround the coffin carrying yachting legend Peter Blake of New Zealand, who was killed by pirates, prior to being loaded on a Brazilian Air Force plane in Macapa, in the Amazonian state of Amapa, late Dec. 9, 2001. 39. Recife, Brazil had 36.82 homicides per 100,000 residents. A policeman arrests a man for vandalism during a protest against the Confederations Cup and the government of Brazil's President Dilma Rousseff in Recife City June 20, 2013. 38. San Juan, Puerto Rico had 37.40 homicides per 100,000 residents. U.S. Army Specialist Michael Montijo joins Puerto Rico Police Department officers on an early morning patrol July 23, 2004 in San Juan, Puerto Rico. 37. Juárez, Mexico had 37.59 homicides per 100,000 residents. A police officer walks near women observing the crime scene where a police officer was killed in downtown Ciudad Juarez August 8, 2013. 36. Baltimore, US had 37.77 homicides per 100,000 residents. 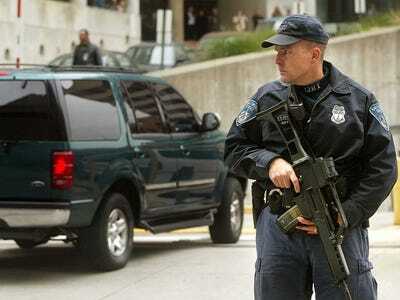 One of a motorcade of vehicles transporting and escorting two sniper suspects enters the U.S. Courthouse for an arraignment hearing Oct. 24, 2002 in Baltimore, Maryland. 35. Medellin, Colombia had 38.06 homicides per 100,000 residents. 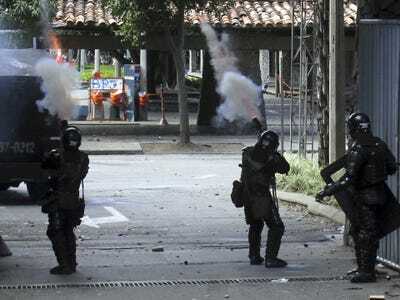 Riot policemen fire their weapons during a protest at the entrance of the University of Antioquia in Medellin, Aug. 28, 2013. 34. Pereira, Colombia had 39.81 homicides per 100,000 residents. 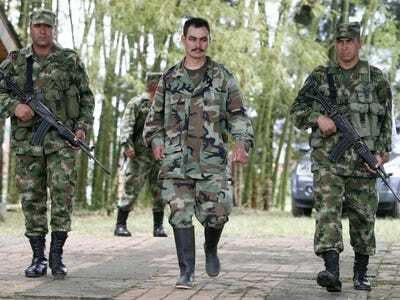 Pedro Pablo Montoya (C), rebel of the FARC known as 'Rojas,' is escorted by soldiers after a news conference at a military base in Pereira March 8, 2008. 33. Cúcuta, Colombia had 42.22 homicides per 100,000 residents. Demonstrators run from tear gas during a protest at the border of Colombia and Venezuela near Cucuta, Colombia, Thursday, Oct. 22, 2009. 32. 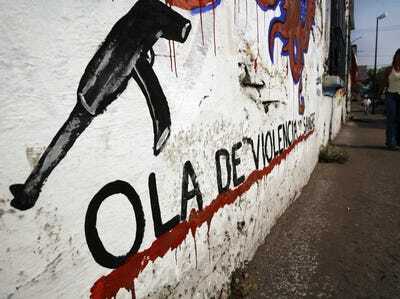 Santa Marta, Colombia had 42.44 homicides per 100,000 residents. 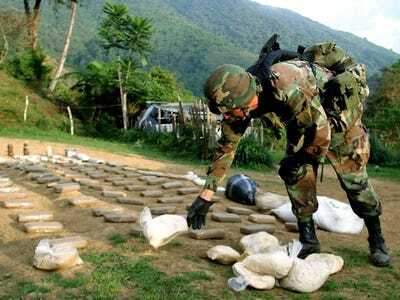 Colombian police seize tons of cocaine every year. 31. Manaus, Brazil had 42.53 homicides per 100,000 residents. 30. Nuevo Laredo, Mexico had 42.90 homicides per 100,000 residents. 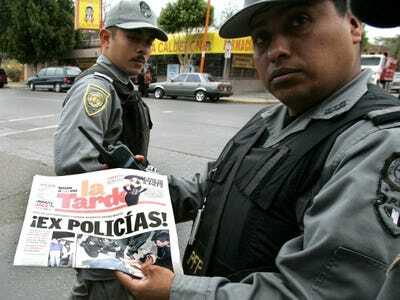 A Mexican Federal Police (PFP) officer passes another officer holding a newspaper with the headline 'ex-police!' over pictures from a recent murder in Nuevo Laredo, Mexico, Wednesday, Jan. 25, 2006. 29. Cuiabá, Brazil had 43.95 homicides per 100,000 residents. 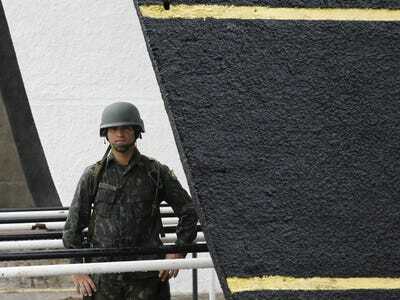 Brazilian soldiers stand guard near where the South Korean team was attending a training session at the stadium of the Universidade Federal de Mato Grosso in Cuiaba, June 15, 2014. 28. Goiânia, Brazil had 44.56 homicides per 100,000 residents. An aerial view of Goiânia, Brazil at night. 26. New Orleans, US had 45.08 homicides per 100,000 residents. 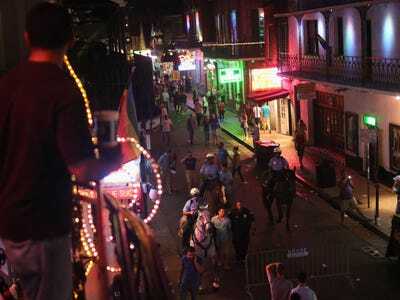 Horse cops on the streets of New Orleans at night. 24. Detroit, US had 46.99 homicides per 100,000 residents. Detroit Police officers remove the crime tape from the scene of a brutal murder of a mother and four children, April 1, 2004 in Detroit, Michigan. 23. Belém, Brazil had 48.23 homicides per 100,000 residents. 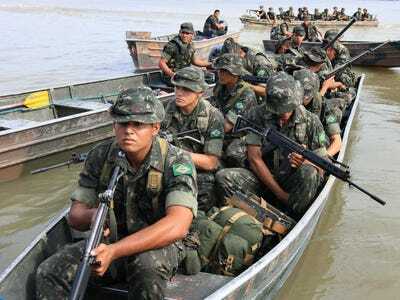 Soldiers prepare to travel to different towns ahead of Brazil's presidential election runoff, at the Pratinha neighbourhood in Belem, Brazil, Friday, Oct. 29, 2010. 22. 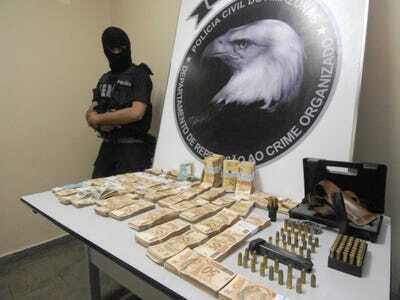 Victoria, Mexico had 49.22 homicides per 100,000 residents. 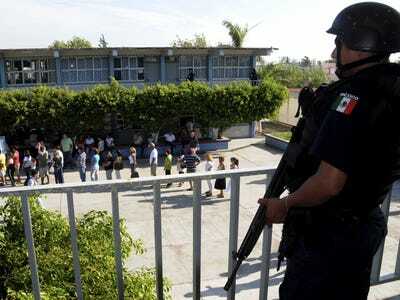 A federal policeman stands guard as residents wait in line to cast their vote at a polling station in Ciudad Victoria, in the Mexican state of Tamaulipas, July 4, 2010. 21. Chihuahua City, Mexico had 50.12 homicides per 100,000 residents. 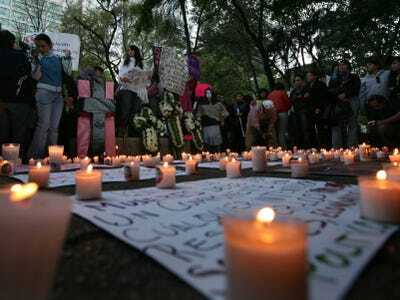 Human rights activists hold a candlelight vigil in front of the Mexican Attorney General's Office in Mexico City, Sunday Jan. 16, 2011. 20. Cape Town, South Africa had 50.94 homicides per 100,000 residents. 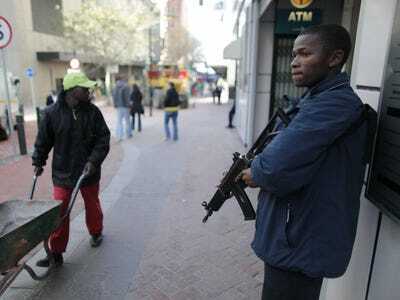 A private security guard stands outside of an ATM machine in downtown Cape Town, June 9, 2010. 19. Kingston, Jamaica had 52.83 homicides per 100,000 residents. 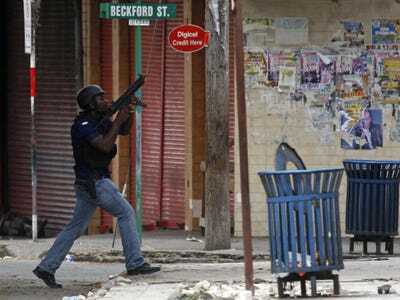 A Jamaican police officer searches overhead buildings near the Tivoli Gardens area of Kingston, Jamaica May 26, 2010. 18. Torreón, Mexico had 54.24 homicides per 100,000 residents. 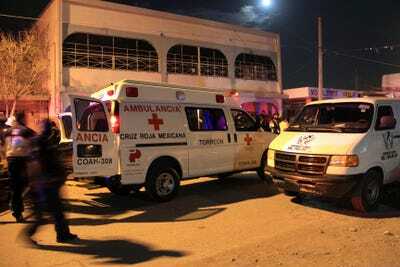 Ambulances are parked outside of the 'Your Life on the Rock' drug rehabilitation center after gunmen opened fire with automatic rifles inside the center killing and injuring several people in Torreon, Mexico, Sunday, June 3, 2012. 16. 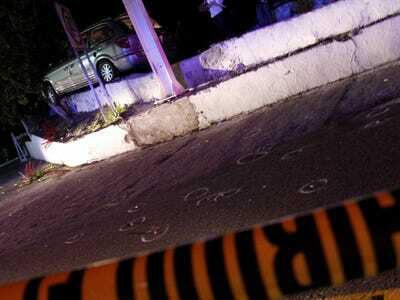 Culiacán, Mexico had 54.57 homicides per 100,000 residents. A woman walks by a mural that reads in Spanish 'Wave of violence and blood' in Culiacan, the capital city of Mexico's Sinaola state, Thursday, May 15, 2008. 14. 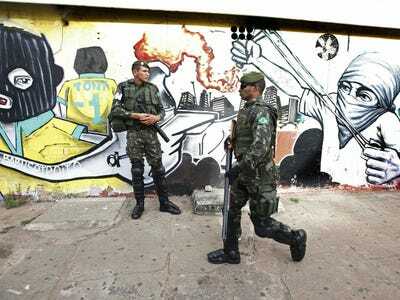 Vitoria, Brazil had 57.39 homicides per 100,000 residents. Amazon Indians talk to police at the entrance to the Belo Monte hydroelectric dam construction site, as they continued their occupation of the area in Vitoria do Xingu, near Altamira in Para State, May 5, 2013. 13. Salvador (and RMS), Brazil had 57.51 homicides per 100,000 residents. 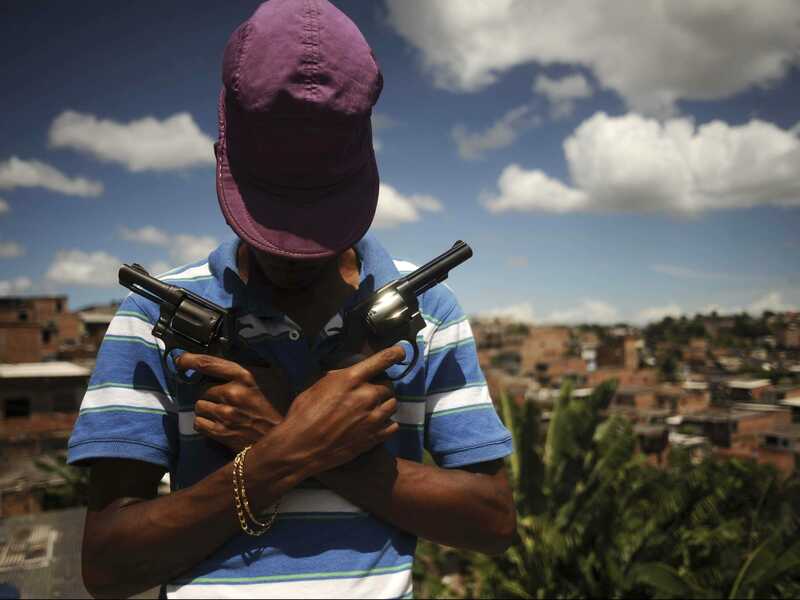 A Brazilian drug gang member nicknamed Poison, 18, poses with a gun atop a hill overlooking a slum in Salvador, Bahia State, April 11, 2013. 12. Natal, Brazil had 57.62 homicides per 100,000 residents. A soldier stands outside at the Maria Lamas Farache-Frasqueirao stadium before the Mexico's national soccer team's training session in Natal, June 14, 2014. 11. Palmira, Colombia had 60.86 homicides per 100,000 residents. 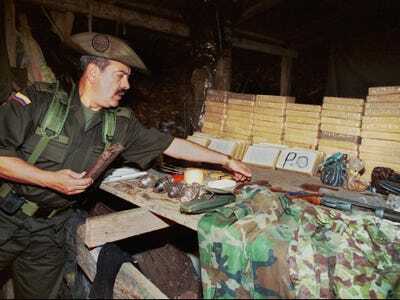 A Colombian soldier organise packs of confiscated cocaine in a laboratory near Palmira, Valle del Cauca province August 20, 2004. 10. Barquisimeto, Venezuela had 64.72 homicides per 100,000 residents. 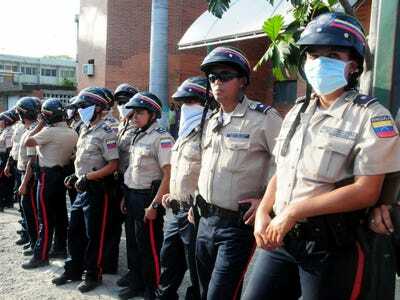 Venezuelan police officers stand guard outside the morgue where the bodies of prisoners killed in a riot were taken in Barquisimeto,Venezuela, Saturday, Jan. 26, 2013. 8. 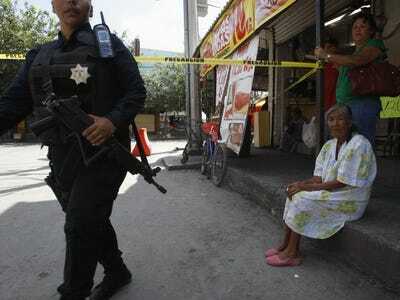 Guatemala City, Guatemala had 68.40 homicides per 100,000 residents. 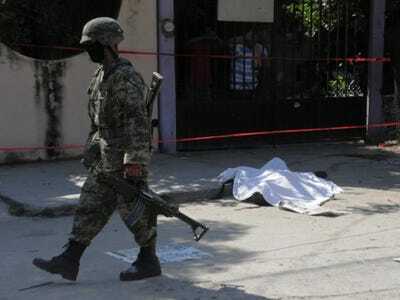 The body of a man lies covered on a pavement after being killed during a shootout at the El Guarda market in Guatemala city Sept. 8, 2011. 7. 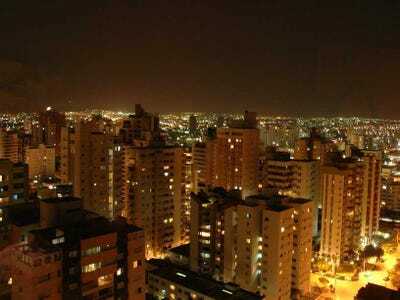 Fortaleza, Brazil had 72.81 homicides per 100,000 residents. Riot policemen face off with demonstrators near a burnt vehicle during a protest near the Estadio Castelao, where the Confederations Cup semi-final match between Spain and Italy is being played, in Fortaleza June 27, 2013. 6. 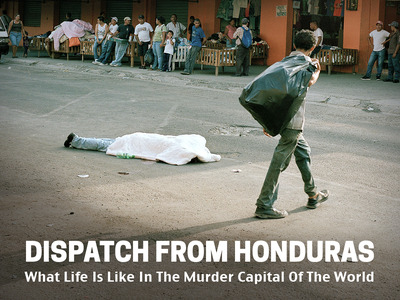 Distrito Central, Honduras had 79.42 homicides per 100,000 residents. A Honduran police officer guards an injured prisoner, standing inside a cell at the Hospital Escuela. 5. Maceió, Brazil had 79.76 homicides per 100,000 residents. Brazil's drug lord Luiz Fernando Costa, also know as 'Fernandinho Beira Mar' (Freddy Seashore), arrives at Federal Police Headquarter in Brasilia March 24, 2006. 4. Cali, Colombia had 83.20 homicides per 100,000 residents. 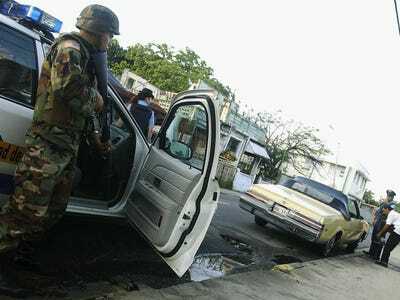 Colombian special investigators carry the body of a car bomb victim in Cali city Sept. 1, 2008. 3. Acapulco, Mexico had 112.80 homicides per 100,000 residents. A body lies in the street in Acapulco, Mexico. 2. 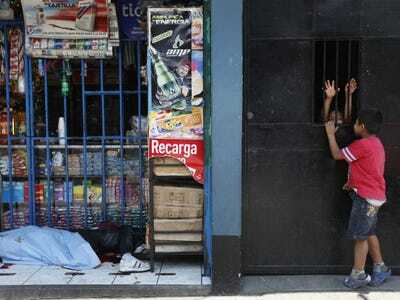 Caracas, Venezuela had 134.36 homicides per 100,000 residents. 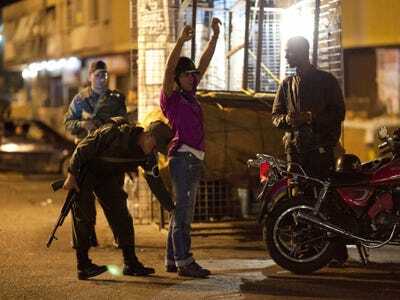 In this May 15, 2013 photo, National Guard soldiers frisk a man at a checkpoint as part of the 'Secure Homeland' initiative in Petare, one of the most dangerous neighborhoods of Caracas, Venezuela. 1. San Pedro Sula, Honduras had 187.14 homicides per 100,000 residents. 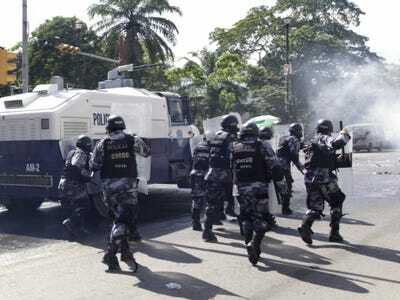 Police fire tear gas to break up a protest in San Pedro Sula, Honduras November 29, 2009. Honduras chooses a new president on Sunday but neither ousted Honduran President Manuel Zelaya nor arch-rival and de facto leader Roberto Micheletti are running in the election, which could give a new president the chance to take Honduras beyond the political gridlock that has divided the Central American nation and cut off international aid.